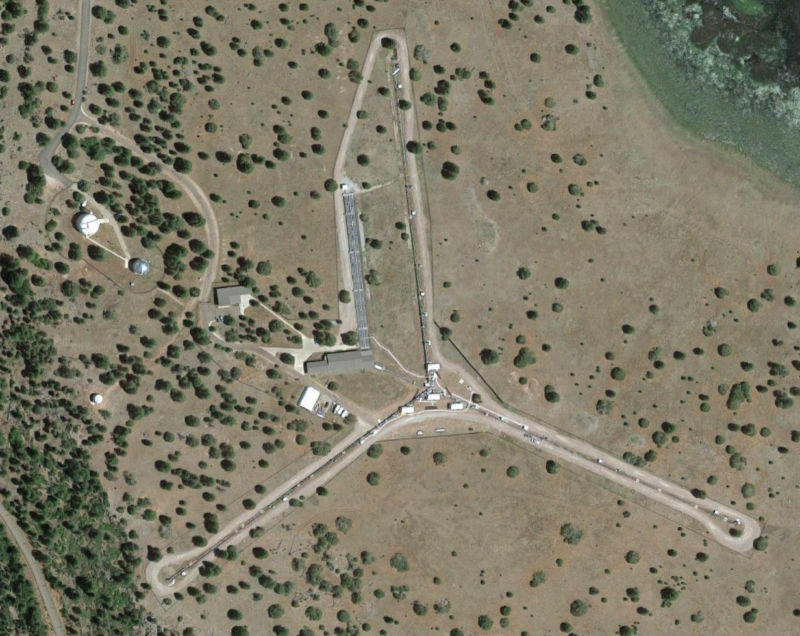 Hexbyte - Tech News - Ars Technica | Building the world’s highest-resolution telescope - HexByte Inc.
/ The Y-shaped Navy Precision Optical Interferometer in northern Arizona can function like a telescope with a mirror 400 meters wide. The Keck Telescopes in Hawaii pushed the boundary by constructing a 10-meter mirror made of many smaller hexagonal mirrors arranged together. The Keck works because the only requirement for a telescope, van Belle explained, is that every ray of celestial light must travel exactly the same distance, even as it strikes the telescope’s primary mirror, bounces off the smaller secondary mirror at the telescope’s snout, and arrives at the camera. No matter where light hits the hardware, every possible bouncing path must be the same length to within 50 nanometers—just one-thousandth the width of a human hair. The 72″ Perkins Telescope was originally built in Ohio before moving to Arizona in 1961. Built in the 1920s, the Perkins Telescope has some serious steel. Modern cameras are attached to this aged behemoth. Watch where you’re pointin’ that thing. When the telescope was moved from Ohio to Arizona, the base had to be angled to account for the change in latitude. The 42-inch Hall Telescope is a little more modern. Fiber optic cables attached to this telescope carry its light to an instrument one floor down. That’s the principle behind the Navy Precision Optical Interferometer, a Y-shaped installation with a functional diameter of up to 430 meters. Three vacuum-evacuated tubes run along each arm of the “Y,” capable of carrying light from a telescope mirror to the center. At various points, a 5-inch telescope mirror bounces star light to a cylinder affectionately called a “lizard head” that redirects it down one of those tubes. Currently, the instrument works with up to six of these mirrors at a time, spanning a total diameter of 100 meters in “zoom” configuration, or hugging the center when in a “wide angle” mode. A mirror inside that clamshell reflects light toward a mirror in the “lizard head,” which directs it down one of the vacuum-evacuated tubes toward the center of the array. Gerard van Belle opens up one of the mirrors in the array. Each tube can carry light from one telescope. Up to six telescopes can be used at a time. A building at the center of the array houses the equipment that makes all this act like one big telescope. This is where it starts to get tricky. It still has to be true that the light hitting all these mirrors travels the same distance (to within 50 nanometers) before hitting the camera. That’s made a bit tricky by the hardware—if there are two mirrors on an arm of the Y, one is obviously farther from the center. But the sky itself poses other challenges. As stars appear over the horizon, their light has to travel across the array to hit the mirrors on the far side. Something has to be done to very precisely sync up all these rays of light. That’s why there are a series of extra tubes extending off the building that houses the camera. Mirrors are placed at different positions in each tube to make light that had a shorter route run an extra lap, so to speak. Inside the building, there is a second set of fine-tuning tubes to accomplish the same task with increasing precision. Inside each of these tubes, the mirrors sit on movable carts. And on the cart, there are three more levels of adjustment: a lever arm on the cart, a voice coil (like a speaker driver) on the lever arm, and a tiny, expanding piezoelectric crystal on the voice coil. The end result is that all the light paths can be dialed in to even less than the 50nm requirement. Mirrors can be placed in each tube—one for each telescope in use—to start to equalize the distance traveled by each light beam before it hits the camera. Inside, a second set of tubes make the final adjustments to ensure each beam of light travels precisely the same distance. Inside each tube is a movable cart that hosts several more layers of fine-tuning adjustment. Once properly adjusted, the light is ready to meet a camera. But if you’re expecting to see a simple little electronic box stuck on the end of these tubes (as I was), you’re way off. Instead, you enter a climate-controlled room that looks like a college physics classroom just after the students left. Tubes enter through the wall and… end. The light shoots out into the open room. An incredible series of hand-sized mirrors arrayed on tables (referred to as “the switchyard”) redirect the light toward an enclosed table on the side of the room that itself holds a Tinkertoy arrangement of mirrors, light-splitting panes, and prisms. Here, light coming from the various mirrors is combined and fiddled with before finally traveling down a fiber-optic cable to reach the image-capturing sensors in the next room. Light leaves the final adjustments tubes and enters an open room.